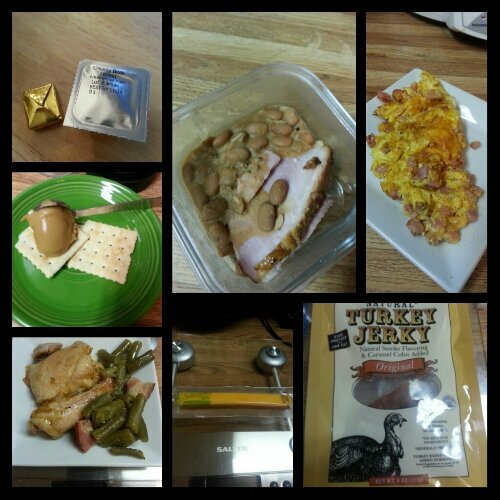 Today’s food choices, from upper right: scrambled egg with ham and cheese; Trader Joe’s turkey jerky; Sargento reduced fat cheddar cheese stick; barbecued boneless skinless chicken thigh with green beans and bacon; almond butter and saltine crackers; multivitamin and calcium supplements x2. Not pictured: Boar’s Head maple glazed chicken breast slices. I am closing in on a weight I have never seen as an adult. This is truly a foreign feeling to me as I have never weighed less than I do now in my adult life. I am currently at my college weight, a weight I have not seen in nearly 20 years. I plan on celebrating by buying these. I am only 100ish pounds away from my surgeon’s goal for me. I feel like my food is controlling me, rather than me controlling my food. Yes, I decide what goes into my mouth, but ultimately, it is the food that determines what gets eaten based on its nutritional value, not how it makes me feel. This was a powerful realization to arrive at, as food has always been something I got excited about eating and enjoying. Now food is a necessity, and not something to savor. Perhaps some day again, it will be, but right now, food is nourishment and little else. I am actually wanting to be more active. This desire increases as the weeks go by, but I’m finding it tough to squeeze in time for that activity due to my work schedule and other commitments. I’m trying to take the baby steps approach to increasing my activity, but as competitive as I am with myself, this is hard for me when I don’t reach the goals I set for myself. I have to learn to deal with this somehow. That’s all I’ve got for now. I’m going to bed earlier tonight in the hopes that I can get comfortable enough to get some good rest. This entry was posted in daily bites, post-op, vsg, weight loss surgery and tagged daily bites, epiphanies, goals, post-op eating, rewarding myself, VSG, vsg realness, WLS, work that head game. Bookmark the permalink.